In Christendom, there are many scripture verses that we like to quote that sound so nice and pretty. They make us feel good and encapsulate some idea that seems above us somehow, like Isaiah 64:8. The imagery of being the clay and God being the potter seems right in line with a pretty Kincaidian view of Christianity. However, there’s a way that we become the clay that’s mentioned earlier in the chapter and it’s far less flattering and pretty. We must take the whole picture, though, if we truly want to experience the joy of giving ourselves over to the potter. The potter verse comes near the end of Isaiah chapter 64. That chapter opens with another beautiful, but slightly more terrifying verse, “Oh that you would rend the heavens and come down, that the mountains might quake at your presence– as when fire kindles brushwood and the fire causes water to boil– to make your name known to your adversaries, and that the nations might tremble at your presence!” (Isaiah 64:1-2). Isaiah is seeing that people don’t know God or remember His greatness. Others who haven’t experienced God are unaware of the awesome power He holds and the fear of Him that we should keep in our hearts. 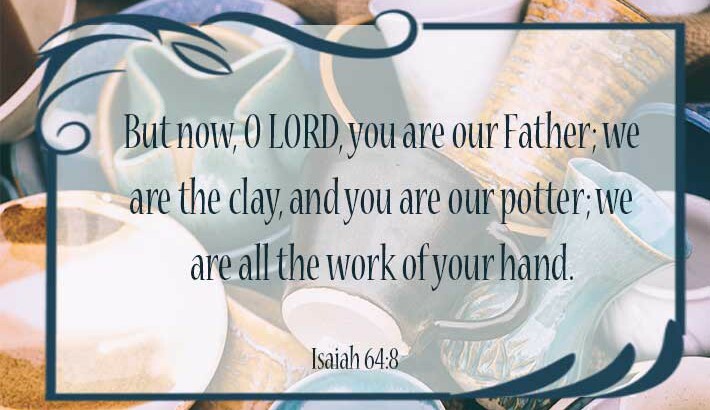 Isaiah goes on to remember the works that God has done and the promise to the righteous, “When you did awesome things that we did not look for, you came down, the mountains quaked at your presence. From of old no one has heard or perceived by the ear, no eye has seen a God besides you, who acts for those who wait for him. You meet him who joyfully works righteousness, those who remember you in your ways.” (Isaiah 64:3-5a) Beautiful reminder! However, there’s more to this chapter than just a promise and reminder of God’s goodness. Isaiah speaks honestly with the Lord in the next section, “Behold, you were angry, and we sinned; in our sins we have been a long time, and shall we be saved? We have all become like one who is unclean, and all our righteous deeds are like a polluted garment. …for you have hidden your face from us, and have made us melt in the hand of our iniquities.” (Isaiah 64:5-7 partial) Uh oh, not so good news in this sentence. Isaiah is talking about the sins of the people and the damage and loss that comes from disobeying the Lord. Now, we finally get to the feel-good verse. After remembering who God is and abject humility because of honest confession of sin, then we talk about being pliable and willing to be formed by God into His design. We become the clay by always remember who the Lord is and keeping His glory and power in the front of our minds. We become clay through honest assessment of our heart’s condition before the Lord and being willing to admit when we’re sinning. Only then can we become transformed into a useful vessel for God’s service, designed and made by His hands. Are you willing to become the clay? Or are you still in the mindset of just assuming that you are the clay? God wants to work with us and save us and create us into His image. 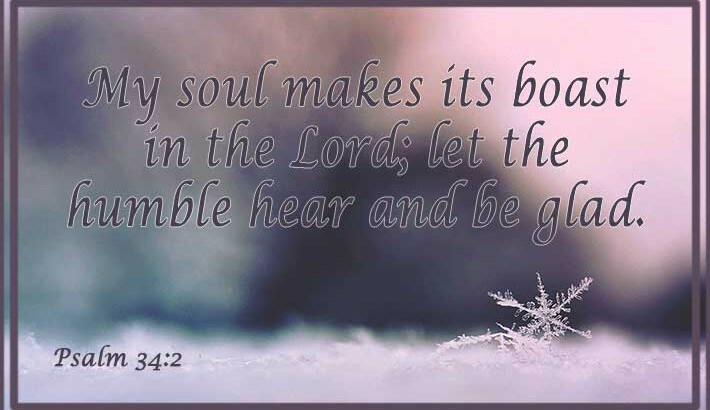 He is calling to us to become the pliable servants who are humble before Him. Compare the promises to those who humble themselves to the promises to those who refuse: servants eat, drink, rejoice and sing. The others are hungry, thirsty, ashamed and in pain. I don’t know about you, but I’m willing to become clay to be able to trust in God and be filled with Him and His goodness. The Lord gives each of us a responsibility toward others in the world. He gives us responsibility that varies from person to person. Some have a great deal and are responsible for many, while others have little and therefore are responsible for little. It could be anything from a pastor over a church to a CEO over a company to a parent. It could be a friendship that God’s asked you to invest in or someone who needs mentorship. No matter what kind of relationships you’re working with, how you handle them is important to God. How do we know if we’re handling it the right way? 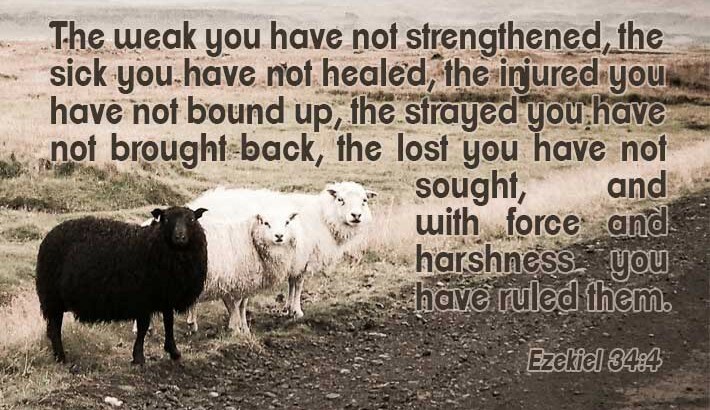 Ezekiel 34:4 lists several responses that should be happening, but doesn’t when we are selfish. Healing the sick, helping the injured, seeking the lost, and being kind are several things that we must be doing. This is not a “would be nice” category. God isn’t politely asking, if we wouldn’t mind, could we help him out and take care of others? He’s saying this is what needs to happen to keep us all healthy and protected. In addition, there’s one thing that’s listed here that we should not be doing: leading with force and harshness. When someone is lacking or hurting, they are vulnerable. If we are a “have” in a world of “have not’s”, we must be very careful to not put burdens on people that they can’t live up to. It’s a huge risk when we are helping others to want to help them to be like us and have what we have and think like we think, but that’s not the goal. We are not the ultimate; God is. Most people would agree with everything said so far here, but I want to take it to another level. I have never knowingly oppressed someone. I have not intentionally withheld food from a hungry person or even blocked someone’s access to healthcare. So, how does this apply to me? How am I supposed to actively seek the health and wellness of the less fortunate when I don’t feel like I’m actively part of the problem? I am fully convinced that the first place that these factors come into play for us is in our words. Are our words full of life for all people in all situation? Our words are an indicator of what’s going on in our hearts, and our actions are an extension of what our hearts believe. If we want to know if we’ve lined ourselves up with the teachings of God’s Word, we need to start by listening carefully to our words. Another factor that must be talked about but often isn’t is this: harshness is cultural. Meaning, you can’t compare your words to the words of people around you in order to determine if your words are harsh or not. What’s acceptable to say and how to say it is determined by many factors, most of which have to do with the people that surround you and the ideals you grew up in. If your culture and mindset and circumstances are filled with harshness, you will not be able to tell that you are harsh. You will blend in and you will be just like everyone else. Harshness, unkindness, and hypocritical thinking can only be identified in one place: the presence of God. Only by comparing yourself to the one source of true love in the world can the light of awareness shine on your words. We must be willing to put ourselves in the light of God and humble enough to allow the truth of what’s there to fill our mind. It will not be pretty; seeing sin in ourselves can be a heavy weight. 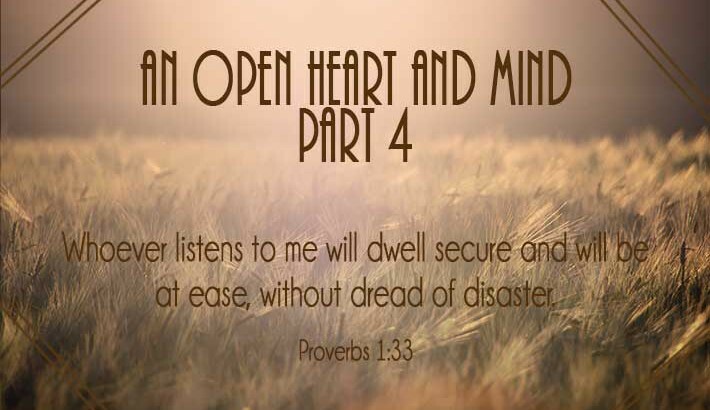 However, when we are holding tightly to the hand of God, that weight is lifted as He takes over renewing our mind and teaching us to be like Him. We cannot let our culture determine our righteousness. We cannot even let our culture ask the questions for us that need to be asked about who we are and what we value. We must step away from what circumstances tells us is right and allow the power of the Lord to lead us and guide us. Only the will we know how to step into building up relationships and people instead of damaging them with every word we speak. Once we know that our words are in line with the truth of God, we can begin to see if our actions and our words are lining up. What we speak is powerful and when we are consciously choosing our words, we can begin to consciously change our world. This seems a bit extreme, but I understand what it’s saying. It’s so much better to have someone who is wise bring harsh truth to you then to have an unwise person build you up. 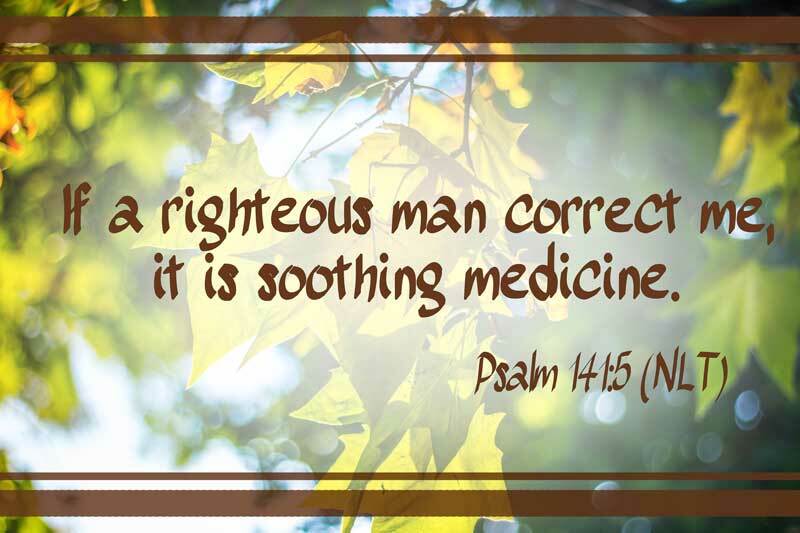 The blessings of listening to righteous correction bring rewards and blessings in our lives. It is good to point out that it is righteous wisdom that we should be listening to, not just any voice. The counselors that we chose to surround ourselves and how well we listen to them are very much indicators of where our lives will be going. David decides to build a house for the Lord after he brings the Ark of the Covenant back to Jerusalem. At first Nathan the prophet agrees with him, saying that the Lord is with David in all he does. That night, however, the Lord gives a message to Nathan saying that David is not the one to build the house. The message reminds David that God is the one who makes the plans for his people, not David. He reminds David that it was the hand of the Lord that brought David to the place that he is now, and it will be God’s work to build the house. Of course, the house God is talking about is the line that brings forth Jesus and the eternal kingship that He has. We can learn two things from this passage about our proper stance before the Lord, especially during a time when we’re walking in His blessing. “The Lord gives and the Lord takes away” is from Job 1:21 and it is a good thing to keep in mind. It can be so tempting to think, in some small way, that we are the ones who achieved what we see around us. God is our source and our light and our provider. Never forget He is the reason for the blessings around us, not us. In this case, David is reminded that God is the one who drew him out as a humble shepherd and made him Kind over Israel. God reminds David that the battles that were won were because of God being with him and cutting off his enemies before Him. David wasn’t the super-star; God was (17:7-8). The future to our eyes is such an unknown, so ambiguous and, if we’re being honest, very frightening. God is the author of not only our days on this earth but the days of all our children and our children’s children to the end of time. We think so small. God’s plan is massive and all-consuming and we are not the center of it. He made us for a purpose and He loves us very much. In fact, He loved each one of us so much that He sent His beloved son to die on the cross. His son dying on the cross is a part of his massive plan, and we are a part of His massive plan. It is so important that we remember that we have to play our part and try to play God’s part. He’s the boss, and that’s the best news we could ever hear (117:14). After hearing this message from Nathan, David goes before the Lord to talk to Him about it. David doesn’t rant about how he had such a great architect lined up and all these brilliant ideas. Instead, he simply accepts what the Lord says and praises God for all the things He promised. In verse 19 David makes a statement that shows how well he understands the Lord. “For your servant’s sake, O Lord, and according to your own heart, you have done all this greatness, in making known all these great things.” The part that jumps out to me is that David knew that God’s revealing His plan to David and the plan itself was for two different reasons: David and God. God isn’t just a slave to the whims and whines of His children, due to give them whatever they want. God’s gifts to us are because of who God is: “according to your own heart.” God’s heart is so loving and giving and generous; he pours out on us according to His heart. Yes, it’s for us and it’s for our good. God knows how to give us good gifts (Matthew 7:11). Seeing the gifts He gives us as just a good gift limits our understanding of Him. He is giving according the joy and goodness in Him. When the Lord told David that He would build a house that lasted forever, David didn’t question or doubt the promise. He didn’t come back with demands to understand how a kingship could last forever, something that no other man-made kingship has ever done. Instead, he accepted it with grace and humility. He also didn’t give into false humility to say that he didn’t deserve it or that God shouldn’t be doing that for him. He simply and elegantly said a version of “Thanks, I appreciate it, and, by the way, You’re awesome.” David accepted both the blessing of the house and the instructions not to build the house. I pray that in my life I will be able to accept and trust the Lord as willingly as David. I also pray that I will be able to remember to have utter humility before the Lord, knowing that He is the true source of all that I am and all that I have. He is such a good and kind God; He is truly worthy of our praise and our trust!